Do you want to help build your child’s math and numeracy skills? Felt a bit like a push poll. Because seriously? What parent would ever answer no? Because, like, sometimes – it’s okay to just be …. average. As long as you’re not my kid. Joking! (Sort of). Be your own unique snowflake! (and here’s a bunch of Baby Einstein stuff to make sure you’re a BETTER than average unique snowflake). Which brings me back to my inbox and the math question. The email was from my local Ontario Early Years’ Centre inviting my 4-6 year old + parent to sign up for a free (FREE!) Esso Family Math program held once a week on Wednesday evenings for the next six-weeks at one of the local elementary schools. My daughter is four. She started kindergarten in September and in the flurry of feedback we’ve gotten since that start date, one piece that struck me from her report card – and subsequent parent-teacher interview – was that she hasn’t yet acquired an understanding of numbers. But she doesn’t yet equate those numbers with “amounts of stuff”. So, I figured six weeks of mommy-daughter bonding time over math couldn’t hurt. And I’m open to all the help I can get! This past Wednesday was our first of six math nights. Given my daughter spent most of the evening on my lap trying – as far as I can figure – to get back in utero – I think she likes the mommy-daughter bonding aspect of this equation. I’m not sure the numbers part of the evening really stuck. The activities were fun, though. The evening’s theme was: Me and My Bear. Keeping with theme we read “Going on a Bear Hunt” – which my daughter loves because we read it at home. This apparently gave her leave, in her mind, to not really pay attention, and spend that time wriggling on my lap like she was experiencing small seizures. Then, each child was given a stuffed bear to keep (which was a winner of an activity if ever there was one) and challenged to make their bear a house out of cardboard boxes to work on geometry and spatial sense. While other kids studiously constructed elaborate multi-Kleenex shoe-box plexes for their bears, my daughter chopped a big enough hole in the end of a Kleenex box, jammed her teddy in, and then asked to play in the kitchen. 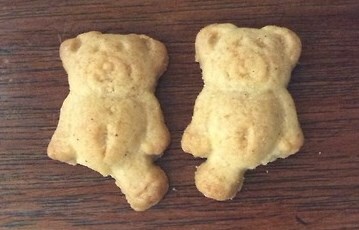 We also had some fun with an estimating game – to work on number sense – where the kids got to estimate the number of Teddy Grahams in a small jar. That activity worked out pretty well, and we’ve played a few times at home since with various things in the little estimating jar they all got to take home. Right now I’d call it more “wild guessing” than “thoughtfully pondered estimating”, but I manage to pull her in with the promise that she can then eat whatever is in the jar. We also did some work on patterns – each child was given a plate and a snack pack of Teddy Grahams and encouraged to shape the teddies into various designs rather than eat them. This also sort of worked (with a little side-snacking) – so I think we’ll play again at home. And a quick google search for “Teddy Graham patterns” reveals this is a bit of a “thing”. However, before the kids were allowed to eat the little guys, they were instructed to grab their stuffed bears and go around the room finding things that were bigger and smaller than stuffed bear. This basically meant my daughter could spend 5 minutes playing in the kitchen so snack time was forgotten! For what it’s worth she’s pretty clear on how bear fits, size-wise, with everything in the kitchen. Other than that, we did some counting (or mumbling in my child’s case) to 30 with a number stick; did a “do you have a stuffed bear at home” yes/no poll, and – while the kids were snacking – resource packs were doled out to the parents before calling it a night. All in all? While my daughter’s attention really wasn’t where I would have liked it (which aligns with another piece of “feedback” we’ve gotten from her JK teacher) it was a fun evening. I’m looking forward to next week and hopeful some of the math stuff “sticks”. I’ll try to blog following each session – my first attempt at a blog series. Why? 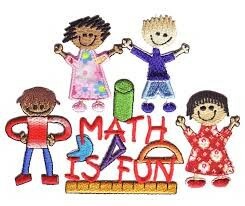 Because – like the picture above says – math is fun! My aim is that she will understand the math joke before she is as old as these guys; while frowning on the vandalism. Parenting is a fine balancing act, isn’t it? Ahhww I remember loving ‘We’re Going on a bear Hunt’ as a child! It really is a fun book for rhyming/repetition, isn’t it?